Evolving from simply reading to being actively engaged and understanding. Students with good reading comprehension don’t just read, they interact with the text. LiteracyPlanet's comprehension content includes hundreds of extracts from a variety of genres, classified according to widely used reading schemas and targeting 13 comprehension strategies. Reading comprehension is an active and interactive process that involves reading a text, processing it and understanding its meaning. The ability to comprehend text is the ultimate goal of reading, and for many students it is not a simple task. It is a more advanced and difficult component of the complex cognitive process of reading and takes time to develop. Skills in reading comprehension distinguish passive readers from active readers. Students with good reading comprehension don’t just read, they interact with the text, and enjoy a more engaging reading experience. Comprehension skills are also a prerequisite for acquiring content knowledge and expressing ideas and opinions through discussion and writing. They help students in all other subjects, and form an important component of functional literacy, the literacy skills required for optimal functioning in everyday life. 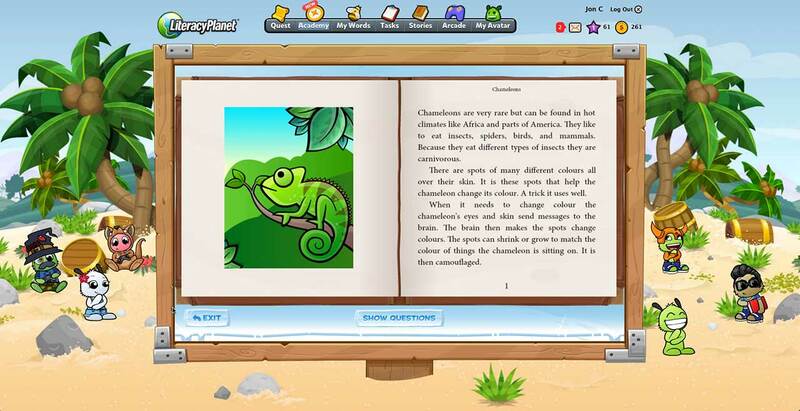 LiteracyPlanet’s comprehension content features hundreds of fiction and non-fiction extracts covering a range of genres and subject categories including creatures, disasters, discoveries, mysteries, people, bizarre and sport.